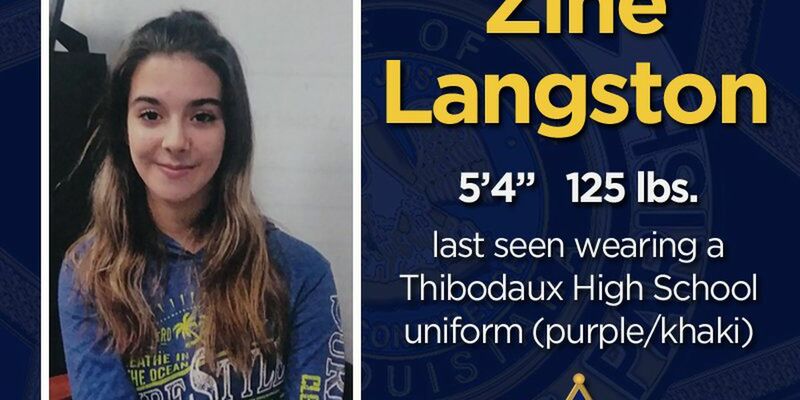 UPDATE - Zine Langston, 15, who was reported missing on Monday has been found, according to the Lafourche Parish Sheriff’s Office. Lt. Brennan Matherne made the announced Tuesday morning and added that Langston was safe. Officials with the Lafourche Parish Sheriff’s Office are searching for a missing teen who was last seen at Thibodaux High School Monday morning. Zine Langston, 15, was last seen wearing a purple and khaki school uniform. She is described as being 5′4″ tall and weighing around 125 pounds. Langston has a history of running away, and is believed to have walked out of school at some point Monday, according to officials. Anyone who has information relevant to locating Langston is urged to contact officials at the Lafourche Parish Sheriff’s Office at (985) 532-2808 or by dialing 911.